• Dual processor - Twice the processing power to maximize performance. • 32 MB cache - Bigger, faster cache means faster performance. • StableTrac - The motor shaft is secured at both ends to reduce system-induced vibration and stabilize platters for accurate tracking, during read and write operations. • NoTouch ramp load technology - The recording head never touches the disk media ensuring significantly less wear to the recording head and media as well as better drive protection in transit. 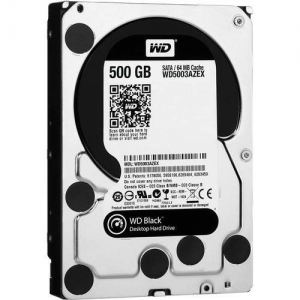 • Massive Capacity - WD Caviar Black SATA drives are available in capacities up to 1 TB. • Compatible - We perform tests on hundreds of systems and a multitude of platforms in our FIT Lab? and Mobile Compatibility Lab to give our customers confidence that our drives will work in their systems.